Nakshidil on the beach in Mauritius. Self-love to me means waking up in the morning and feeling in tune with my mind, body and soul. It’s the positive energy that courses through my body when the sunlight hits my skin or that sense of euphoria that engulfs me on demand. My drive and determination to constantly feel the love that surrounds me is what I use as my fuel to grow and bask in my passions. I think that’s one of the most important parts about self-love; it’s the ability for someone to understand herself in a profound manner that yields acceptance. Being able to wake up every morning and accept who you are and where you have been is the most powerful weapon on earth because it ultimately acts as a motivator. One of the things my mom has always told me and it continues to resonate with me is that life is volatile; you need to enjoy the simple pleasures of life while you can. I am a lover of clouds. I often stop in the middle of what I am doing if I am outside just to admire them. I love laying down under trees in the shade and watching the way the sunlight hits the leaves. It makes me feel at peace and I can remove myself from the hustle and bustle of my daily routine and hectic surroundings. I make it a point to take a few minutes every day to do the superman pose. I stand tall with my hands on my hips and look at the sky. I take deep breaths and tell myself I’ve got this. I can do this. Today is my day. I have also realized the importance of doing the things I love when I feel like it and to invest myself, wholeheartedly, in everything I undertake. I cook often because I love food. It’s therapeutic and soothes my mind. Being around my friends and family brightens my day and I find solace in seeing those dear to my heart happy, so I try to spend as much time as possible around the people I care about most. 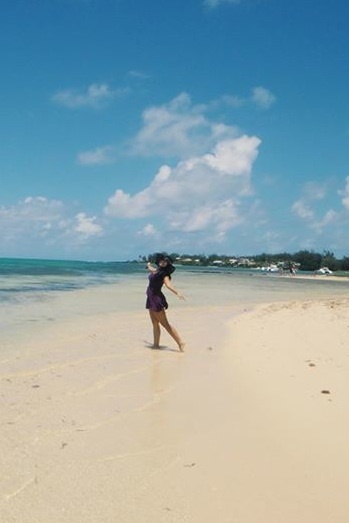 Another thing that makes me feel alive is dancing. I find every opportunity I can to dance. Whether it’s raining, music or no music, while shopping – it brightens my soul and makes me feel alive. I think that moving to America for my undergraduate studies was one the biggest obstacles and adventures I embarked on. The culture shock and being away from home (alongside several different personal experiences) made me understand that self-love and acceptance of the different experiences that I have been affected by are what make me who I am. It has transformed me into the woman I am now. I have found strength in times of weakness, determination in times of despair, and love in times of pain. I have learned that I am my biggest supporter and I am stronger than I know. Self-love has taught me that in order to heal I need to accept, and once I have accepted I can begin building my foundation for empowerment. Thank you for sharing your story with us, Nakshidil. You are definitely a Phoenix Rising! Categories: Love Yourself First! 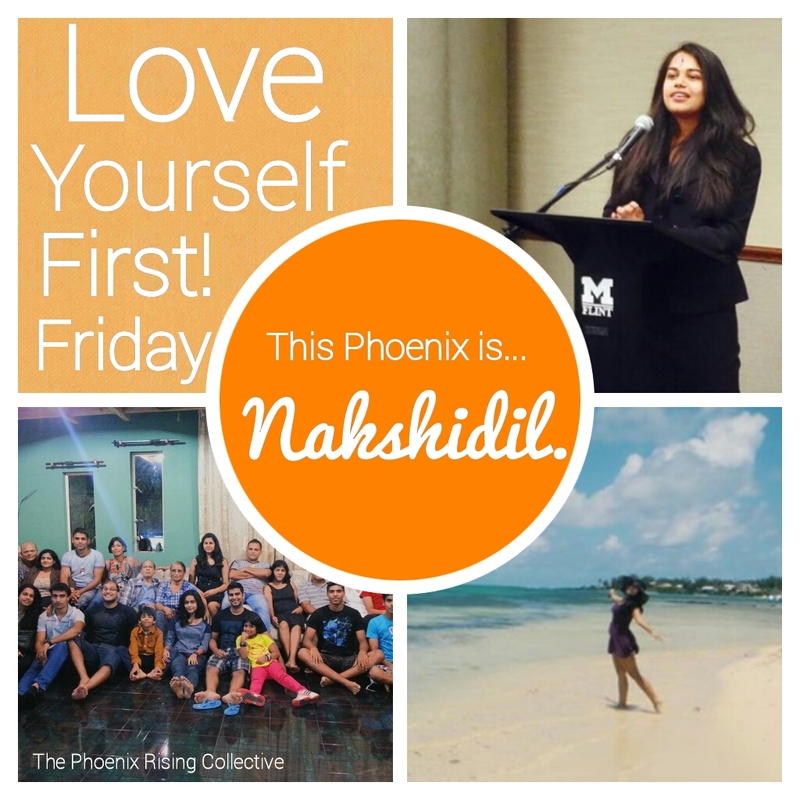 Friday | Tags: empowerment, inspiration, intentional living, Love Yourself First, mindfulness, personal growth, self-esteem, self-love, the phoenix rising collective, women and wellness | Permalink. This is absolutely amazing. I really like this website and the message behind it. I read this article piece because Nakshidil is my friend and I know her personally, but since being on the website I will be checking this site more often. Great message from Nakshidil, great advice I will personally use in my everyday life.